We’d love your help. Let us know what’s wrong with this preview of With Napoleon in Russia by Armand de Caulaincourt. Nowhere is the tragedy of the Napoleon's Russsian campaign described as clearly as in the memoirs of Armand de Caulaincourt. He was an aristocrat of the ancien regime who had come to tems with the French Revolution and was ready to serve the new Emperor. Riding day by day at Napoleon's side, Caulaincourt witnessed the growing horror of defeat which culminated in the Grande Armee's disastrous retreat from the vast expanses of Russia. The Grande Armee had entered Russia triumphantly on 18 June 1812 with as many as 600,000 men, while the remnants that staggered out of Russia in December that year were a mere few thousand. In military terms it was a catastophe; the recent discovery of mass graves in Vilnius, Lithuania, bear testimony to the terrible human cost of the campaign. To ask other readers questions about With Napoleon in Russia, please sign up. The major part of this book is fairly interesting as Caulaincourt (Master of the Horse), and self-proclaimed devotee of Napoleon describes the trauma and tragedy of the Russian campaign. His negative views of the campaign are obvious early on, which makes the reader wonder why he stuck around as the army moves farther and farther into Russia. A cynic might believe it's so he could say, "I told you so" as things go from bad to worse. In fact, Caulaincourt continues to tell Napoleon and the reader The major part of this book is fairly interesting as Caulaincourt (Master of the Horse), and self-proclaimed devotee of Napoleon describes the trauma and tragedy of the Russian campaign. His negative views of the campaign are obvious early on, which makes the reader wonder why he stuck around as the army moves farther and farther into Russia. A cynic might believe it's so he could say, "I told you so" as things go from bad to worse. In fact, Caulaincourt continues to tell Napoleon and the reader why things have gone wrong. He even threatens to walk out at times, but is always persuaded to continue his service. Perhaps, he enjoys being at the left hand of a military genius or he likes having the second-hand power of his position. Whatever it is, he continues to describe the battles, the fires in Moscow, and the retreat back to France. This works until December 5, 1812, when Napoleon takes the monumental step of returning to France on his own (with Caulaincourt at his side of course), leaving his men under the command of Marshal Murat, who also eventually manages to leave the army. From then until December 19, when they arrive in Paris, the book becomes a virtual non-stop rant by Napoleon about the things which have gone wrong, the nations which have betrayed him, the people who disappointed him, his glorious actions of the past, and his plans for the future, once he has successfully rallied the French people to him again. Frankly, it becomes rather boring. If it is all true, Caulaincourt earned his pay just for listening. The memoirs of the ill-fated Russian campaign written by Napoleon's aide-de-camp and master of horse, are a rare and unique window into the workings of willpower as a catalyst of fate. Dormant for over 100 years, Caulaincourt's diary lay unpublished and in the possession of his family until World War I, when the German army destroyed his state, and with it, the original manuscript. That was until 1934, when explorations amidst the rubble of his chateau, helped unearth a twisted metal safe that c The memoirs of the ill-fated Russian campaign written by Napoleon's aide-de-camp and master of horse, are a rare and unique window into the workings of willpower as a catalyst of fate. Dormant for over 100 years, Caulaincourt's diary lay unpublished and in the possession of his family until World War I, when the German army destroyed his state, and with it, the original manuscript. That was until 1934, when explorations amidst the rubble of his chateau, helped unearth a twisted metal safe that contained the damped, but unscathed diary of the great general. It was published immediately and became an overnight sensation between military circles at the time. General Guderian comments while on the Eastern Front in 1941, how "Caulaincourt's account was lingering in everyone's head, and for the first time we thought of the possibility of failure..."
Quite simply a fascinating, primary source account of Napoleonic efforts on the Russian Campaign. The Aide de Camp in question General Armand De Caulaincourt (Duke of Vicenza) walks the reader through the events as they occurred. He had kept meticulous notes along the time span of events. This account of the Russian Campaign is a wonderful accompaniment to Tolstoy’s “War and Peace.” I was slightly disappointed in “War and Peace” in that all through that book Tolstoy never once references The Tre Quite simply a fascinating, primary source account of Napoleonic efforts on the Russian Campaign. The Aide de Camp in question General Armand De Caulaincourt (Duke of Vicenza) walks the reader through the events as they occurred. He had kept meticulous notes along the time span of events. This account of the Russian Campaign is a wonderful accompaniment to Tolstoy’s “War and Peace.” I was slightly disappointed in “War and Peace” in that all through that book Tolstoy never once references The Treaty of Tilsit (1807). It is in effect this treaty breakdown that leads one today to learn of the events of Napoleon and La Grande Armée fighting the Russians, a capture of Moscow, a burning of Moscow by Cossacks, an attempt at a truce with the Tsar, and then a captivating retreat during the early winter months of 1812. For whatever may have been the fault of Napoleon; at least he gets into Russia by horse whereby 130 years later Corporal Hitler cannot by motor transport, air, and tank. As odd as this may be placed here in this review it is in fact the truth – both took off for Moscow during the month of June (different years) but Napoleon is entrenched in Moscow by near mid-September of 1812. The Treaty of Tilsit is referenced somewhere between 15 to 20 times during the course of the full read. It is a treaty that cannot be ignored for it is this that is the foundation of the War in Russia. Chapter 8 in this book is in my opinion the most important of the events of Moscow. There are three elements to the events that the Duke of Vicenza wrote that led to the French retreat. The first, is the courage of the young officers. Though courage itself is not a detrimental characteristic during time of battle, siege, war and other such events it is noticeable to him that the courage in this case lacked foresight and “method” in employing the courage required. In this sense courage becomes a hollow and lonely attribute with little direction. The second issue was the onslaught of winter. De Caulaincourt writes that the Emperor had a strong belief in his French troops – though Cossacks were successfully employing in guerilla warfare (as would be later confirmed in the 1821 essay by Denis Davydov entitled “Essay Towards a Theory of Guerrilla Warfare”) where the goal was simply “ubit da duiti” (kill and escape). The Emperor (according to the Duke) was using his words of the time to mark “wishful thinking”. The third and fatal blow to La Grande Armée was as follows: On a personal level there are things I have learned about troops, grunts, Special Forces, and other military organizations over the course of my personal experience and life. On page 161 the General informs the reader that the greatest enemy to the French Forces in Moscow was the “lack of discipline”. This is explained after he has detailed the training efforts by officers upon newly inducted troops of the army. Herein lays a distinction between the French of 1812 retreating from Moscow and some 140+ years later the retreat at the Chosin Reservoir during the Korean War by NATO Forces – predominantly X Corps which also included the1st Marine Division, the 41 Royal Marines and ROK Forces, and all the U.S. Army elements so assigned to X Corps	. The Chosin Reservoir escape was one in which “morale” was not the enemy – the cold and North Koreans along with a greater foe in Peoples Republic of China Forces. Still, they were held at bay and checked all along the retreating lines of the time. General Ned Almond during the Korean War was the “idiot” and not General Douglas MacArthur. 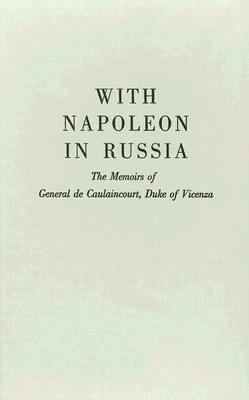 The final 25% of this book is based on the conversations and tribulations as Napoleon is considered to have “abandoned” the French Forces on 5 December 1812; however, the Emperor had to return to France to ensure his political survival following the coup d'état by General Claude de Malet. In this reader’s point of view Napoleon did what he had to do and when the time was necessary. The conversations were quite telling while as Napoleon and his Aide de Campe; General Armand De Calaincourt, Duke of Vicenza travel through the snow to Paris. In part the conversations entail the successes and defeats vs. the Russians and the future. There is quite a telling conversation on page 305 of Napoleon’s view of America at this point with her own war of 1812. The perspective is of course for the future of the United States and though he was off just slightly on some predictions; many more were “spot on” and something that made this reader raise an eyebrow upon. This is essential reading for anyone who enjoyed the military history in War and Peace. General Caulaincourt was at Napoleon's side throughout the magnificent assault and the disasterous winter retreat. When the horses froze to death he walked. As the once mighty French army moved, humiliated, through Poland and as they limped back into Paris, he was there. This is not a history book. It is military history as it should be writ; by an accute observor who, with minimum of gloss and spin, tells the reader how it really was. Don't be put off by the archaic lanuage, the translation fro General Caulaincourt was at Napoleon's side throughout the magnificent assault and the disasterous winter retreat. When the horses froze to death he walked. As the once mighty French army moved, humiliated, through Poland and as they limped back into Paris, he was there. This is not a history book. It is military history as it should be writ; by an accute observor who, with minimum of gloss and spin, tells the reader how it really was. Don't be put off by the archaic lanuage, the translation from the original French is good and after a few pages you get into the swing. He is both admiring and critical of Napoleon. In fact, for stdents of the Emperor this book provide valuable insights into what dove the man and his considerable ego. I found it hard to put down, but then I am fascinated by Napoleon and military campaigns. 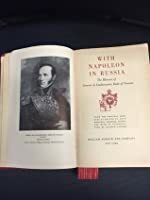 Written by Napoleon's "Master of Horse", this book details from a first-hand perspective Napoleon's decision to invade Russia, the disastrous decision to occupy Moscow and the resulting retreat and disintegration of the French Army. It includings N's personal musings on this life, his ambitions and his legacy. It is definitely not a complete history of the campaign and some parallel (or prior) reading is required. There are things I still don't understand but this book tells a gripping story. An essential piece for anyone seeking to learn more on the Grande Armée and Napoleon's 1812 campaign into Russia. However, Caulaincourt distances himself from many of Bonaparte's crucial decisions that determined the outcome of Russia's "success". Unto itself not something to read just for the heck of it. Invaluable resource/ partner Volume to War and Peace.